Turning trash into gold requires a little more than the Midas touch—it requires imagination and passion. And Adrian Pinto had it all. For 15 years, he watched wineries across the country producing tonnes of pomace, and wondered if the leftovers could be put into use. 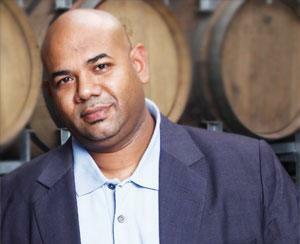 In 2012, Pinto, then senior manager at spirits manufacturer Pernod Ricard India, started researching on the composition of pomace, and realised that its fibre could be exploited for paper-making. To see it for himself, he set out to manufacture the first batch of grape paper in his kitchen armed with a blender and some nets. “I loved its colour and texture,” says Pinto. And since then, there has been no looking back. He applied for a course on crafting luxury and lifestyle businesses at the Indian Institute of Management, Ahmedabad; filed a patent application with the World Intellectual Property Organization in May 2016; and founded Green Paper Works to commercially manufacture the paper. The Mumbai-based firm produced 150 tonnes of grape paper this year. With black specks on an off-white background, grape paper is ideal for packaging and making files, folders and boxes. Pinto says he has started receiving orders from bulk suppliers in the country and paper crafts manufacturers in West Asia and Germany. Pinto’s grape paper is an addition to the growing list of handmade papers manufactured from organic waste. Another such product is Haathi Chaap, which was born out of Mahima Mehra’s passion for recycling. A decade ago, Mehra, head of Delhi-based paper-making company Papeterie, visited a shrine at Amer Fort near Jaipur. The place reeked of elephant dung. But Mehra noticed an uncanny similarity between the dung texture and the fibres used for paper-making. And there sprouted the idea of making paper out of elephant poop. The colour of Haathi Chaap paper varies from light brown to dark brown, depending on what the elephant gets to eat. “We source the raw material from elephants in Amer. Usually, we do not have to pay for the dung. But when we do, we pay in kind, like sugarcane or grains for the elephants,” Mehra says. Her paper is in demand for making bags, frames, photo-albums, notebooks, cards and tags. There are also companies that manufacture paper from banana stem and skin. One such is Taj Paper Udyog. In 1992, the Jaipurbased manufacturer of handmade cotton paper received a request for paper that could be used in lampshades. Artisans at Taj Paper experimented with a variety of raw materials and found that only banana fibre could match the desired thinness and transparency. Since then, the company has been making handmade papers from banana fibres as well. The light brown paper can be used to make file covers, folders, writing pads, art paper and printing paper. 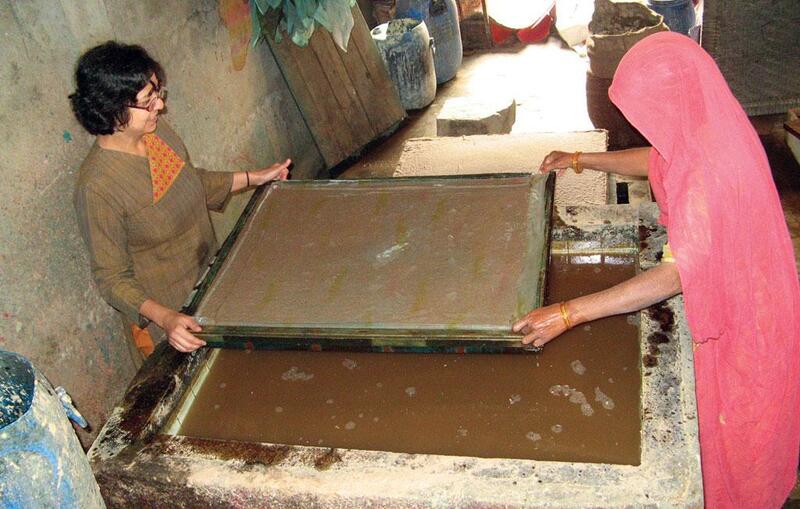 While handmade papers made from organic wastes have received appreciation from all corners, they have a niche market. The prime reason for this is that the paper from organic waste is 25-30 per cent more expensive than that made from recycled paper strips and cotton. Depending on the mass per unit area, a standard grape paper sheet costs from Rs 30 to Rs 40, and a Haathi Chaap sheet costs between Rs 20 and Rs 70. The manufacturers attribute the high cost of the products to high manufacturing cost. “Customers often ask us why Haathi Chaap paper is costlier, given that we get elephant dung for free,” says Mehra. The answer is, she adds, the process of manufacturing handmade paper from organic wastes is labour-intensive. Making paper out of poop involves additional steps, such as disinfection and softening of fibres. In certain cases, the high cost of raw material makes the product expensive. Taj Paper buys banana fibre at the rate of Rs 8-9 per 50-60 g. In contrast, 60 g of cotton fibre costs just Rs 4, says Aadil Taj, sales director of the company. Manufacturers also factor in the time-consuming process while deciding the product cost. “We make 250 sheets of banana paper in a day as opposed to 2,500 sheets of cotton paper,” he admits. Besides, manufacturing of the paper comes to a standstill during the monsoon and winters as they need to be sun-dried. Another challenge is to ensure the quality. Achieving that extra-white smooth finish of mill-made paper is still a distant dream for handmade paper manufacturers. Although handmade papers can be used in deskjet printers, they tend to spoil the machinery of laser printers. “We are now researching on ways to improve the texture of handmade papers,” Mehra says. P G Mukundan, secretary general of the Indian Association of Recycled Paper Manufacturers, says the government should help create a market for such papers by incentivising it and promoting its use in offices. A major reason for this is organic waste-based paper has a great potential to reduce the burden on forests and landfills. According to the Central Pulp and Paper Research Institute, paper consumption in India jumped 48 per cent in four years—from 11.15 million tonnes (MT) in 2010 to 16.51 MT in 2014. The demand is set to rise by 7-8 per cent a year, as per India Ratings Report 2014-15. This will have a disastrous impact on forest resources. Almost 24 per cent of the 800-odd paper mills in the country depend on wood for making paper. Organic waste based paper also ensures efficient utilisation of waste. For instance, wineries in India produce nearly 5,000 tonnes of pomace annually, and all of it ends up in landfills, Pinto says. Similarly, banana crop generates huge quantity of biomass in the form of pseudostem, leaves and suckers. In fact, farmers spend Rs 8,000-10,000 per hectare for disposing of the pseudostem. Promotion of banana paper could put this waste to good use. Fortunately, the market for such products is opening up. In its report titled, India Paper Industry Forecast and Opportun ities, 2017, Tech Sci Research, a management consulting firm in Uttar Pradesh, says the focus of the paper industry is shifting towards eco-friendly products. The article has been taken from the 1-15 Sepetember, 2016 issue of Down To Earth magazine.